I always have my coffee and Yum Yum Gum at the gym. Phew! This week flew by. We had a couple of days of snow, and the weatherman is calling for more snow and dangerously cold temps today and early this week. Sounds like a perfect time to work on a few house projects! 🙂 My in-laws and parents were at the house through the holidays and helped us unpack, paint, hang blinds and artwork, and organize. It was a huge help, and we are feeling somewhat settled into our new house! I enjoyed a few days of gym clients this week. I train at a decent gym facility, but one consistent complaint that I get from my clients is that the air is so dry. In fact, my clients typically bring gum in their gym bags to chew through our workouts (and I do the same). I’ve recently had the opportunity to review Yum Yum gum. As you can see from the photo on the right, Yum Yum Gum comes in super unique and fun tubes versus the typical gum packaging. The tubes make the gum easy to transport and dispense at the gym. 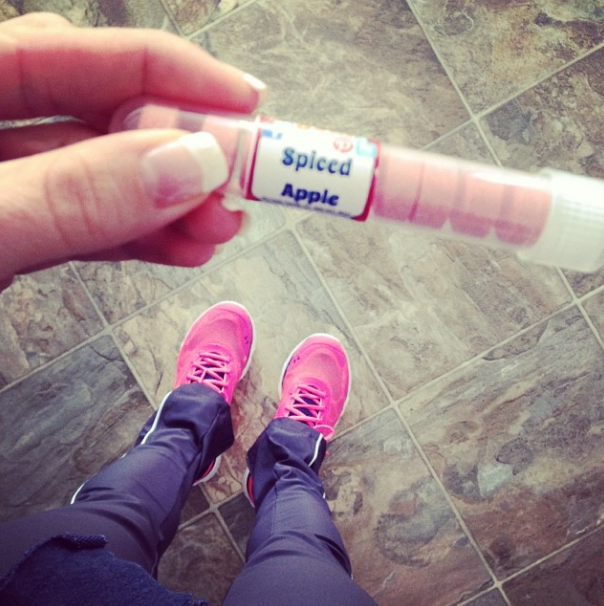 Spiced Apple is my favorite Yum Yum flavor. Yum Yum Gum is sugar-free! I have taste-tested several kinds, but my favorite so far is Spiced Apple. I usually pop one or two in my mouth right before a workout, and the flavor lasts through the hour. 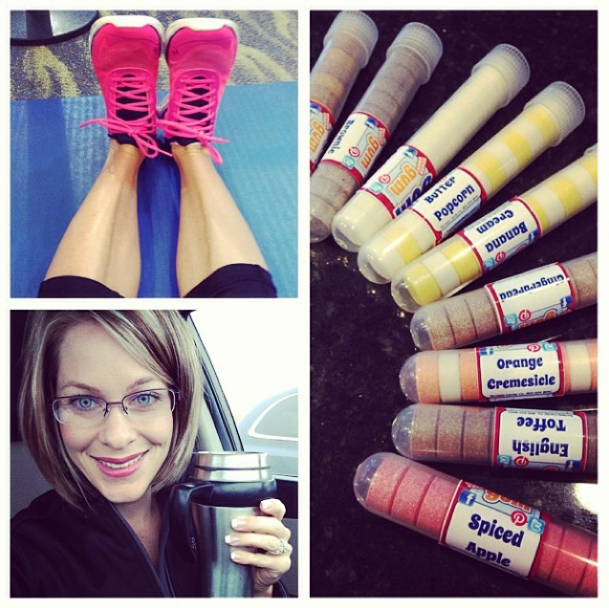 One of my Instagram friends recently saw my photos of Yum Yum Gum and purchased several tubes herself to help curb pregnancy cravings for sugary treats. I thought that was a great idea, and have been popping the gum in my mouth at home when I am tempted to grab a cookie or bowl of ice cream. I want YOU to have the opportunity to taste-test Yum Yum Gum as well. Follow these easy steps to earn entries into my Yum Yum Gum giveaway. Leave a comment for each item that you complete. I will select a winner later this week and send her a few tubes of Yum Yum Gum! Comment on this post and share what Yum Yum Gum flavor you are dying to try. I never have heard of it ! Fruit Punch sounds delish ! Or chocolate mint ! I am also curious about the cherry cola too ! WOW. So many flavors. Hard to pick just one! would love to try cupcake though! So many interesting flavors! Would like to try the citrus or raspberry. Completed each item 🙂 liked yum yum gum on fb and shared, and have been following you for months! been following you on instagram and would love to try blueberry! I follow Fit Pregnancy and Parenting on Instagram! Love your posts and cute photos of your family. I like how you show good pictures and pictures when things aren’t always going “perfect.” You are blessed! I want to try the fruit punch! Yum Yum!